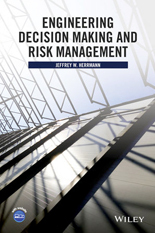 Associate Professor Jeffrey Herrmann (ME/ISR) has written a new book, Engineering Decision Making and Risk Management, that emphasizes practical issues and examples of decision making with applications in engineering design and management. It is published by Wiley. In the book, Herrmann presents and discusses three perspectives on decision making: problem solving, the decision-making process and decision-making systems. He highlights formal techniques for group decision making and game theory and includes numerical examples to compare and contrast different quantitative techniques. Herrmann also emphasizes the importance of initially selecting the most appropriate decision-making process through practical examples and applications that illustrate a variety of useful processes. The book also features theoretically sound and practical tools and examples for decision making under uncertainty from the perspective of both historical and current events. The book is intended as a textbook for upper-undergraduate and graduate students taking courses on decision analysis, decision making, and risk management within engineering design, operations research, business and management science, and industrial and systems engineering. It also can be used as a reference for academics and practitioners in business and management science, operations research, engineering design, systems engineering, applied mathematics, and statistics.